HCMC (Ho Chi Minh City) officially, Saigon to most, still. The city streaming with manic motorbikes and multicoloured helmets bobbing like buoys on a charging ocean is a pulsation of garish colours, blaring sounds, and potent odours that can fluctuate from fragrant pervasions in luxury malls contouring the historic opera to pungent emanations from soup kitchens cluttering pavements around Saigon Market. HCMC – orientally-alluring/Frenchly-demure/wannabe-Bangkok – is sometimes like a bad cocktail with too many ingredients muddled the wrong way (not that one ever drinks cocktails, Cristal Rosé is more sensible by far). But bad cocktails make for giddy highs, feel thronging tourists and expats and Chinese businessmen whose bulging wallets get bleached into high-end designer boutiques…. Though HCMC has hastened, time lolls in the magnificent French architecture, quaint, quiet streets and striated history of Hanoi. Between heaving HCMC and the colonial romance of the capital slither conterminous blue and white snakes of sea and sand patterned with spruce new resorts that have lately made of Vietnam an en-vogue, elite beach destination. Some Americans still resist Vietnam – they think the war rages on. And yet, few visitors today would suspect the luxuriously evolved destination was war-ravaged, brutalised by a long and especially cruel colonialism. The Vietnamese, in fervid impatience to erase the past and lure tourists, are coating bullet-pocked, blood-splashed walls with posh veneer. Tourists mustn’t suspect that the Vietnamese have endured, that Vietnam is a ‘third world country’, I’m often told. Forget Halong Bay frequented by tourists whose proportions approach those of the immense rock formations. Find Vietnam’s naughtiest love-nests, instead…. Luxury idyll on Vietnam’s most astoundingly beautiful island Con Dao. The naturally beautiful require few adornments: bare minimalism accentuates the Six Senses Con Dao resort’s natural assets. Tanned beaches laze like long sun-bathed legs by varnished waters. Dressed only are hills in veloured verdure cascading towards the resort like emerald mantles. Sublime setting but it’s from the sublime to the ridiculous when at breakfast I hear an American mother bellow at her boy, “Put that muffin down now! You’ve already had a doughnut.” If only holidaying Indian parents were as severe, our brats wouldn’t resemble orangutans. Con Dao is better known as Brangelina’s Vietnamese hideaway than for its historic significance as the site of French and American prisons, notably the notorious Tiger Cages that exterminated 20,000 Vietnamese prisoners (at least). I’m oblivious to these atrocities, enveloped in tranquillity that feels unimpregnable. Until Nature decides to throw a tantrum. Then, sheets of sand come at you like a flying carpet, greedy tongues of water lick the beach with increasing virility until in an act of uninhibited voracity the ocean devours the sand, seemingly swallows up your private pool (the one costing you $1500/night…) and lunges onto your villa’s white-clad bed waiting like a virgin. Captivated by wild nature, I replace pre-arranged Prison Tours with a nature walk. But my butler Phi Anh persists: any visitor to Con Dao must know of its horrifying history. Discovering the notorious Tiger Cages and prisoner cemetery where lotus ponds shimmer in the rain evoking a Monet painting, leaves those of us who aren’t American tourists (they traipse through sites of unspeakable tortures as if in Disneyland) philosophising over the existence of perversion in paradisal exotica. Almost a jarring exemplification of the parabolic Garden of Eden with its concomitant Evil. Celebrity designer Bill Bensley declared, “I can make something that pleases everyone. But I’d rather make a statement.” He makes one worth a stupendous $200 million. Bensley’s Harvard mind flaunts in searing decorative wit and soaring fancy. Russians whizz in for Michelin-starred French Chef Michel Roux’s $120/head Chef’s Table at La Maison 1888 whose private dining spaces Bensley turns into bedrooms for the ‘house’s’ three children. ‘Voyager’ son’s ‘room’ explores the travel theme, ‘accountant’ son’s room is accountably designed. Their sister’s room is a ravishingly red boudoir with bustiers, and an antique bed from which mademoiselle’s bare (mannequin) legs dangle impudently. 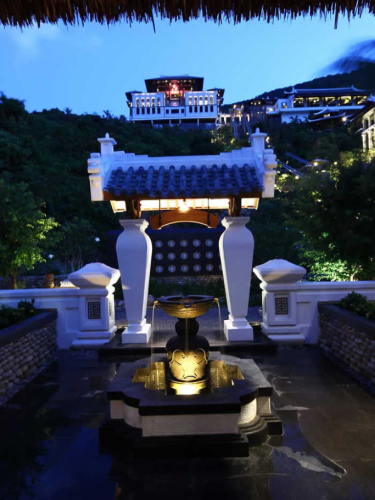 The Intercontinental Danang Sun Peninsula resort is about destination spa and drama. There’s fairytale too. The 37-year-old French GM Arnaud is Prince Charmant. But clowning staff surely belong in a circus and not a fairytale? Where the groomed and the gorgeous go are to Nam Hai’s villas in dark wood and stark white that have freeflow platforms bearing the tub by a daybed seeping into a ‘desk’ appended to the bed that descends into the ‘living room’. By the bed sits a TV. Superfluous when a live typhoon unleashes outside: palm trees swirl their helpless arms like windmill blades gone wild, swinging, swaying, swooning, thrashing irrationally at the grass. Galloping waves charge towards the beach like concatenated white steeds as howling winds drown the humble hissing of battered plants. A live spectacle is the least one can expect at exclusive abodes nowadays. Missing only are the sound effects. Alas, stormed-out young F&B Manager Dominic can’t furnish Wagner’s sombre Tristan and Isolde, or Mussorgsky’s Night on a Bare Mountain. Heritage, iconic, perhaps Vietnam’s grandest address is Sofitel Legend Metropole. Resident of the opulent Opera quarter with its haute-luxe boutiques; receptor of royals (just recently Britain’s Prince Andrew), film stars, literary figures and ambassadors galore; receiver of ever multiplying awards. A staff member reveals, “When I joined four months back, we’d won 18 awards this year. Now we have 30!” Naturellement, when your airport transfer is a BMW stocking can-rival-Ladurée macarons. And you’ve a can-surpass-the-Ritz concierge and can-scorn-Claridges suites, erstwhile receptacles of Somerset Maugham, Graham Greene and Charlie Chaplin in the heritage wing. Mine’s a glamorised newer suite, full of finery and finesse, marbled bathrooms with ornate stand-alone tubs and Hermès toiletries. I’m on a boat, on a bay cloaked in night, cruising to the rustic retreat whose laze on the rolling rocks makes it seem embedded on a slumbering dragon (of the Scottish rather than Vietnamese variety), its flickering lights like gleaming dragon’s scales. My butler Trang, like Charon of Greek myth ferrying souls across the river Styx to the world of eternal repose, plies me between resort jetty and my rock villa cradled on boulders. Morning unveils the rugged romance of an almost masculine seascape. No blue-eyed waters and frilly white waves purring coyly. The bay seems more Shakespeare’s ‘Green eyed monster’, but benign. The serenity is maybe monkish. After supper at neighbouring Anlam Resort, where culinary sophistication is sauced in sagas of how their guests weep with content, I need a Six Senses facial back at the Six Senses Ninh Van Bay, to unhinge clenched jaws and a massage to appease revulsed shoulders. Anantara Hoi An’s is no ‘destination’ spa, I’m warned. Yet their four-hand Vietnamese massage, with fingers in a flurried and fervent dance of synchronised rhythmic movements and elbows pirouetting on pressure points, is unchallenged. One needn’t be a ‘branded’ spa to brand one’s excellence on a troubled back. Nor does one need an expat chef to awe a demanding palate. Vietnamese Chef Vien’s Vietnamese noodle soup pho is pho-nomenal. And I’m returning for their Vietnamese iced coffee, the finest in all of Vietnam. The playful ‘Healing Hotel of the World’, Fusion Maia, dispenses free spa treatments and ‘fusionistas’ who design your experience. Their racy new ‘raw food’ touches a raw nerve, the high-sensitivity epicurean one. It’s about creativity and colour. Stunning exhibits include a white plate checkered with shocking-pink beetroot squares sliced to a nanometer on which cubed almond paté presides or vibrant avocado sherbert reeled in screaming yellow lemon peel. Chef Dung’s soft-as-seduction Vietnamese coffee mousse he cunningly dispatched for clandestine in-villa consumption, lest anyone descry the indelicate demolitions. La Résidence’s GM Mr Minh, the sole Vietnamese GM I encounter, runs Vietnam’s most efficient hotel (UNESCO World Heritage Hue), discrediting expats who asseverate Vietnam requires foreigners to manage it. Mr Minh feeds me Hue’s fabled culinary heritage, elucidating that Nguyen Emperor Minh Manh had 300 concubines (and 142 children). Satisfying all his harem regularly daunted even the Nguyen Dynasty’s mightiest emperor, for whose affections the ladies combatted ferociously. It was resolved that concubines would prepare desserts and she who produced the finest would have the emperor for a midnight feast, as it were. La Résidence serves Minh Manh wine ice cream. “Is this royal food I’m having then?” I enquire. “I leave that to your imagination,” Mr Minh quips. Hope not – originally the wine (which enabled the emperor to help himself to six women/night) comprised bear’s claws and elephant…. I leave that to your imagination.